offered in brush drive or traction drive and the cylindrical model is traction drive. 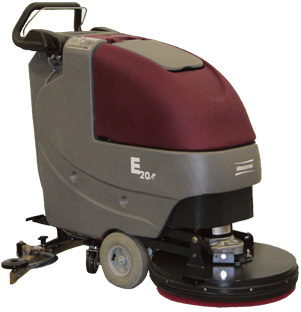 Advanced technology makes the E20 a part of the innovative walk-behind scrubber line, the E Series. Easy-to-understand controls ensure that the machine is simple to operate. line of sight to the area to be cleaned. The adjustable handle and ergonomic hand bails offer superior handling of the machine and the traction drive models offer ergonomic, adjustable speed regulation with the turn of a dial. The E20 contains an on-board charger that is convenient and allows the machine to be charged anywhere. When the on-board charger is plugged in, the machine is not operable. The brush loading/unloading is as easy as the turn of a switch and the operator never has to manually remove the brushes. A parabolic squeegee is standard. A parabolic squeegee is standard on both models. The squeegees are designed so that no operator adjustment is necessary. This vacuum contains 12 gallon solution tank and a easy-to-clean, hygienic, 13 gallon recovery tank.